Debbie is a nationally recognized thought leader, innovator and speaker on Revenue Marketing with more than 30 years of experience applying strategy, technology and process to help B2B companies drive revenue growth. 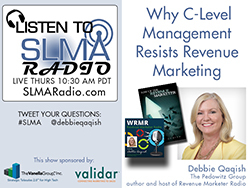 She is the author of the award winning book – “Rise of the Revenue Marketer,” Chancellor of Revenue Marketing University, and host of Revenue Marketer Radio (WRMR). She coined the term “Revenue Marketer” in 2011. As a principal partner and chief strategy officer of The Pedowitz Group, Debbie is responsible for developing and managing global client relationships, as well as leading the firm’s thought leadership initiatives. Debbie is also PhD candidate and her dissertation topic is how the CMO adopts financial accountability in an e-marketing environment. TPG has worked with over 1,300 clients, across multiple marketing automation platforms, in diverse industries, sizes and global locations. They have won multiple awards for our work. But, more importantly, so have its customers. TPG is at the forefront of thought leadership in this space. It’s consultants hold more than 200 certifications combined which includes Oracle Marketing Cloud (Eloqua), Marketo and salesforce.com to name a few. Feel free to visit its resources section where you will find compelling content that will help you on your Revenue Marketing Journey.